Wright Patman Lake is in the forested portion of the West Gulf Coastal Plains physiographic province. 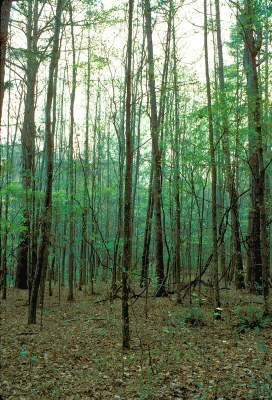 This forested portion of the coastal plains is called the East Texas timber belt. It coincides with the surface sands and sandy clays of the Wilcox outcrop belt. This area features gently rolling hills covered with a mixture of hardwoods and pines. Visitors can see woodland birds around the camping and picnic areas and along the hiking trails on the east side of the park. These include brown-headed nuthatches and pine warblers. In winter, the picnic area offers the best views of ducks (such as buffleheads and ruddy ducks), American white pelicans and double-crested cormorants. Also in winter, birders can see various species of gulls around the dam. As for fishing, lots of crappie, largemouth bass, white bass and several species of sunfish populate the lake. Quality-size fish are available. Plentiful catfish—channel, blue and flathead—swim here, too. Trees are the focal point at Atlanta State Park, with 90-foot tall pines and hardwoods studding the shores of Wright Patman Lake. Short leaf pine and white oak grow in the park. Many loblolly pines and other varieties of oak also grow here. Fall color is spectacular, while in the spring, dogwoods in bloom brighten the understory.